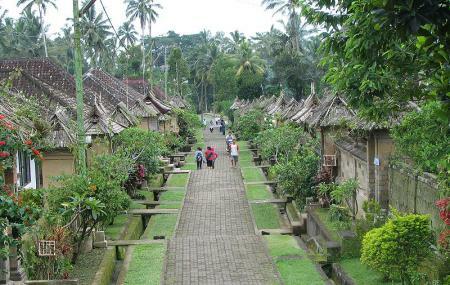 This is one of the most fascinating communities on the island of Bali. 700 meters above the sea level, its atmosphere is quite cool. The entire village is neatly laid out, with the lush tropical trees decorating the sides of the roads and the spaces between the houses. The layout of the village is based on Hindu municipal traditions. It is thought that once upon a time this was the place the royal family came to to amuse themselves. The old temples and remnants of old monuments certainly seem to suggest so. The houses are beautiful and made of wood. Well, bamboo actually. The streets are made of stone, and flowers grow around every corner. The people of the village came out onto the streets to hang out in the evening.There are of course food stalls and drink stalls for you to refuel at. Also remember to check out the souvenir shops. You will leave this place feeling as if this is exactly what all communities should feel like. After all, this is said to be one of the cleanest villages in the world. Vehicles are not allowed inside the village. People normally club together Sangeh Monkey Forest and Echo Beach while planning their visit to Penglipuran. People also prefer to end their day with Penglipuran.